Why must Education sector focus on Cyber security? There is a reason behind calling Media, 'the fourth pillar of democracy'. Being the backbone of democracy, media plays a very important and impartial role between government activities and general public. The media has undoubtedly evolved and become more active over the years. It is the media that exposes loopholes in the democratic system, which ultimately helps government in filling the vacuums of loopholes and making a system more accountable, responsive and citizen-friendly. A democracy without media is like a vehicle without wheels. Mass media has a global availability and it has converted the whole world in to a global village. In the term 'Media and Mass Communication', the media is referred to the medium of transmitting news and mass communication is the act of reaching to the masses and spread the word. Modern media comes in different formats, including print media (books, magazines, and newspapers), television, movies, video games, music, cell phones, various kinds of software, and the Internet. Each type of media involves both content, and also a device or object through which that content is delivered. The media industry has evolved into a powerful entity over the years. As per FICCI-KPMG Indian Media and Entertainment Industry Report 2015, the Indian Media Industry is expected to grow at a CAGR of 13.9 per cent in the coming years. It clearly means that this sector is expected to become nearly Rs 1,964 billion by 2019. Due to its phenomenal growth in the past few years countless media colleges are mushrooming everywhere in the country. The media education sector is not as old as compared to other disciplines; it is young and dynamic in its own way. Several colleges and universities are offering UG, PG, and Ph.D. programmes to the students in different types of media. From Content writing, Investigative journalism, Digital journalism to Radio journalism, Communication for Development and Broadcast Journalism, the scope and job prospects for media students are endless and vast. The only thing that the aspirants required is the sheer zeal of communicating with the public at the large, no matter through writing or just anchoring in a news channel; the core idea is to share. But this sudden advancement has given birth to too many such institutions that are lacking highly in terms of infrastructure, faculty members and teaching pedagogy. Understanding the power and sensitivity of media professionals, it becomes very essential to inculcate the right amount of ethics and practical knowledge in them. 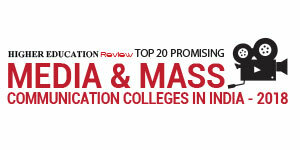 Hence, we at Higher Education Review Magazine have compiled a list of media and mass communication colleges that are standing tall among its counterparts as, 'Top 20 Promising Media Colleges in India-2018'.Our expert panel has gone through numerous researches and rankings before preparing this list and we expect that optimum number of student will be able to clear their doubts through this. Asian Academy of Film & Television Noida, Uttar Pradesh A one of its kind institute, AAFT is equipped with latest equipments and laboratories coupled with courses that are customized to meet the specific training needs required in todayâ€™s media professionals. Azaz Rizvi College of Journalism and Mass Communication Lucknow, Uttar Pradesh Striving to provide quality media education, the institute is a perfect hub for media students who aspire to receive well rounded education in journalism and develop advanced skills. Christ University Bangalore, Karnataka The Department of Media Studies at Christ University lays stress on an extensive practical agenda in an effort to help students align themselves with the demands and relatives of the industry. Delhi School of Communication New Delhi, Delhi One of the elite institute in providing Media & Communication courses, at Delhi school of Communication students study in a very conducive environment that encourage them to touch new heights of success. DG Vaishnav College Chennai, Tamil Nadu The college is a well-known institution in Chennai, generating competent media professionals who are taught by a highly qualified team of faculty members. IFIM College Bangalore, Karnataka Promoting holistic education through its unique academic delivery of domain knowledge, IFIM College keeps primary focus on enhancing the knowledge and employability skills of the students. Indira School of Communication Pune, Maharashtra The institution has proved to be a premium institute since its inception through providing quality communication education to its students, who are encouraged to think innovative and out of the box. Lady Shri Ram College for Women New Delhi, Delhi One of the pioneer institutes for women at University of Delhi with highly qualified and experienced faculty members, the institute provides the best personal and intellectual growth. Manipal University Jaipur Jaipur, Rajasthan The institute offers a unique integrated program in media studies combined with the right blend of computer application skills as well as a firm background in social, behavioral and policy sciences. Mudra Institute of Communication Ahmedabad, Gujarat A niche media institute for creating media managers and leaders in media and communications, MICA offers 100 percent placement assistance and collaborations with international institutes. Navrachna University Vadodara, Gujarat The university create leaders who can bring about a change in local and national conditions and make a difference internationally through the power of quality education. Presidency College Bangalore, Karnataka Known for offering international standard education, the institute is committed to break out the monotony among the students and encourage adopting creativity so that they understand the power of imagination. Shasun Jain College for Women Chennai, Tamil Nadu The institute aims to promote women education by providing them opportunities to explore career in the desired field and strengthen their ability in reconstructing a new era of women society. Shri Vaishnav Institute of Journalism and Mass Communication Indore, Madhya Pradesh Understanding hands-on training as one of the top-most priorities, the institute is packed with quality faculties who have a right mix of academics and industrial experience for providing practical exposure to the students. Sir J.J Institute of Applied Art Mumbai, Maharashtra Based in Mumbai, the institute has a strong alumni based who have set a high standard for other batches by achieving excellence in their respective field of work. Symbiosis Institute of Media and Communication Pune, Maharashtra One of the largest post-graduate institutes in the Media and Communication space, the institute is equipped with advanced curriculum, focused delivery, expert faculty and hand-picked students. The Bhawanipore Education Society College Kolkata, West Bengal An undergraduate college that is dedicated to strengthen the base of media students and inculcate values and ethics which will help learners to grow in their careers. Usha Pravin Gandhi College of Management Mumbai, Maharashtra An institute that focuses more on raising the employability quotient is widely known for its unbeatable placement and is rendering not only education but also decent jobs to its students. Xavier Institute of Communications Mumbai, Maharashtra An autonomous educational unit of the Bombay St.Xavier's College Society Trust, XIC is a professional media centre which offers a variety of services in training and production.